When J Lucas Reyes saw me during our Brunch shoot, 5 hours before our second wedding, he took one look at my pink gown and said "Crazy. You're so anti-wedding!" 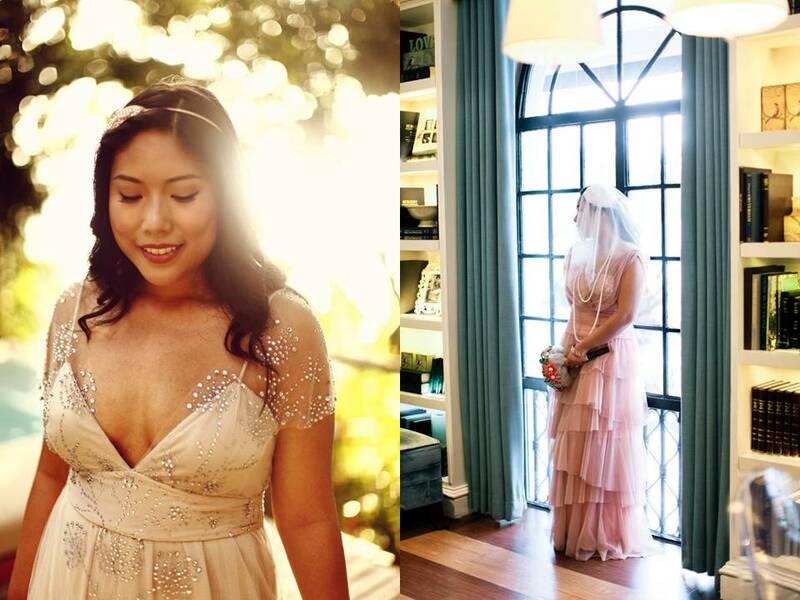 Even before my first wedding in Boracay, I already knew that I was not going to be destined for a white wedding gown. There was one time in college, when out of curiosity I bought a wedding magazine and my friends and I looked at every page, and I announced to them, I won't wear white when my time comes. My friends tried to convince me otherwise. They said, it's the only chance you'll ever get to wear a white gown! My only thought balloon was, was wearing a white gown a milestone in life? Because from what I could recall, you already had to wear a white gown during baptism, and a white dress during your first communion--isn't that enough?!?!? Then about 2 months before our Boracay wedding, Regine Velasquez' own wedding was shown on national TV, and my mom even went out of her way to text me that she hated Regine's red bridal gown. I gulped. Then after my first wedding, in which my gown was obviously not white, about 3 days before the second wedding my mom was breathing down my neck asking "White ba ang gown mo? White? White? White?!?!". I pretended to be deaf. I AM NOT COMFORTABLE IN A WHITE GOWN. Phew! There I said it. Why will I force a tradition that doesn't flatter my beautiful natural, tanned skin, and my curvy-licious body? Not only that but my friends could really attest to the fact that white is really not my personality. In fact most of my friends would say, that when they think of me, the initial word that comes to their mind is colorful (Then Kate Spade hehe). Why would I pretend to be someone I am not, during the most important day of my life? And why would I make myself look darker than I already am, in again, the most important day of my life? It's like punishing myself. 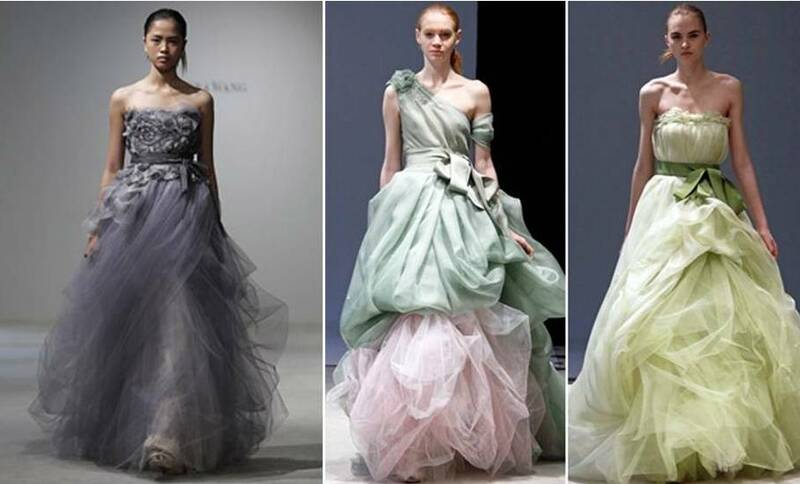 Beautiful colored wedding gowns have actually been slowly cropping up. In fact, visionary wedding designers have been rallying for it years ago, but sadly, brides aren't so keen on it so designers are still forced to create white gowns. Vera Wang recently came out with her 2011 bridal collection where colored bridal gowns took center stage, and most designers have also featured their own colored bridal gowns for this year. I think that this is the designers' way of saying that they themselves are already sick of white bridal gowns and it's time to move on. Hehe. If you are considering going anti-white, it's difficult to look for bridal gown pegs because there are still very few compared to white bridal gowns -- and that's probably the reason why the very thought of wearing a colored bridal gown doesn't become as appealing. I researched on this gown and printed out every version of Drew Barrymore's picture in it. But you know what? In the end, I didn't even show this to Hindy. Because I still wanted her to create a unique design, just for me. So what was this peg for then? I think that the word "peg" has been loosely used. A peg should be an inspiration, something for you to visualize. But I don't think a peg should be copied, or that it should be the basis of the actual output--because it is insulting for creative people to be asked to "copy" a design, and also because you deserve a gown to be made just for you. I used this "peg" to encourage me that going "colored" is beautiful. But I didn't necessarily copied it. So my advice is, look for colored gowns that you love -- make a collage out of it, and pump yourself up. Heck--go to Rustan's and try fitting colored gowns from Tadashi Shoji, Max Azria, Chinese Laundry, etc. and see how it feels. Then, evaluate local designers whom you feel can take your colored gown vision to the next level. 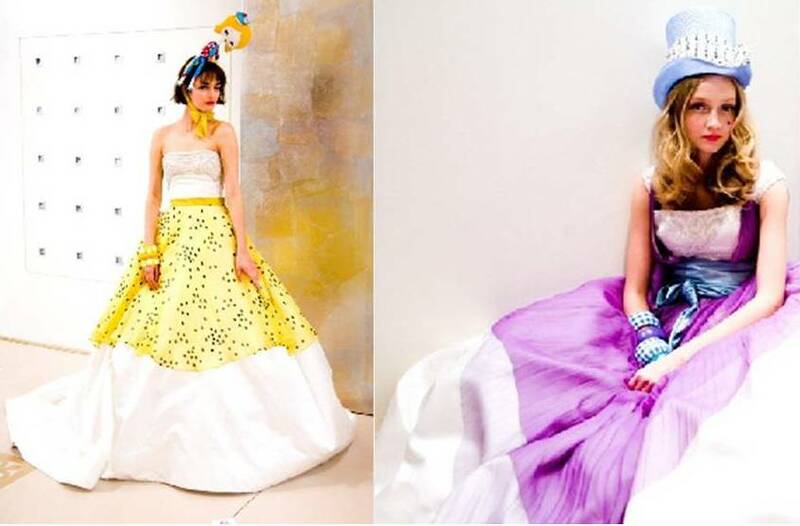 My personal recommendations would be Hindy Weber Tantoco, Avel Bacudio, Sassa Jimenez, and Mich Dulce on the basis of their range, technique, and colorful designs. The ONLY alleged reason why a white bridal gown became the tradition for weddings is because it symbolized purity or virginity. One statement: A Rebellious Bride is Not Pretentious. Let's be real, please. Pure? Oh come on. Let's celebrate who we are, every curve, every color, every rebellious act we may have done in the past and wear a bridal gown that shouts to the world who we really are. But you know what? White bridal gowns are not even originally about religion or whatnot. It actually started out as a TREND (See below related article).